If you want the best possible protection for your front bumper, you want to look at accessories that protect both the surface of the bumper AND the underside. You can purchase wide, front bumper guards. 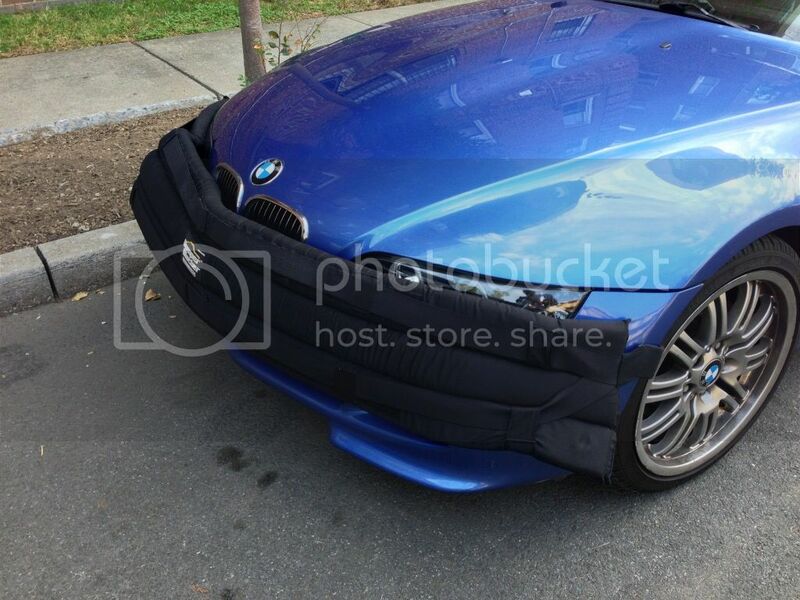 Usually built from foam and/or cotton materials and secured with Velcro, they offer some bumper protection. Really used for parking protection, they help prevent the scratches, dings, and minor dents that parking maneuvers can cause. However, they don’t look great. They block some of the grille and air dam, so these guards aren’t ideal for much travel. Also, they don't offer much (if any) protection to the underside from curbs, speed bumps, road debris, and more. A rubber license plate surround that’s at least 3” thick serves as the first point of contact when your car bumps into something else. However, it doesn’t protect your front bumper from scratches, nor does it protect the bumper’s underside. Many car owners who are concerned about the appearance of their cars choose to forgo installing thick rubber license plate surrounds because they don’t always look good. The All-Fit Flex Trim is an adhesive protection strip that can be added to any bumper. Available in a few different finishes, these products offer decent bumper scratch protection from other cars while parked. However, this bumper strip doesn’t protect the underside from curbs or speed bumps. Most people who purchase the All-Fit Flex Trim also purchase the All-Fit Universal Lip to protect the underside. The All-Fit Universal Lip is a thick and durable rubber strip that’s designed to be attached to the underside of your front bumper. It does a fantastic job of protecting the underside of the front bumper from curbs, speed bumps, and other obstacles. Not only that, but the All-Fit Universal Lip also looks great and definitely gives cars a lowered look along with protection. The only thing it doesn’t offer is front bumper surface protection, but that’s what the All-Fit Flex Trim is for. You know the 3M transparent film some people use to cover their hoods? You can use that same film to cover your front bumper. Installation can be pretty tricky, though, given the many curves your bumper has. That film will protect your front bumper from scrapes and scratches, but it won’t do anything if your car bumps into something else hard enough to leave a crack or dent. Out of all the five options listed above, it’s pretty clear that the All-Fit Trim and Universal Lip offer the most protection when combined. Learn more about All-Fit products here.